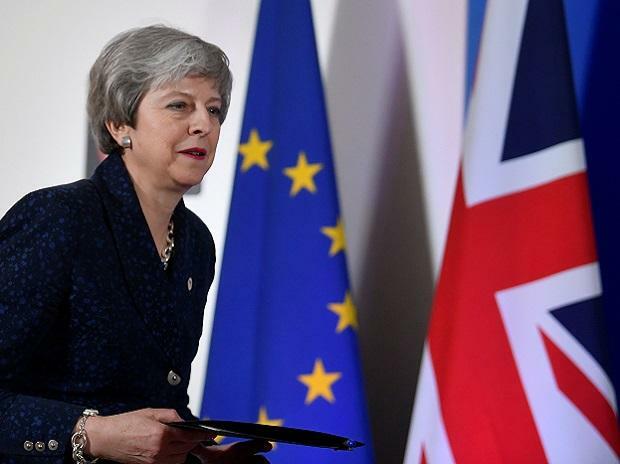 UK Prime Minister Theresa May on Monday admitted that she did not have enough support to get her EU divorce bill through the House of Commons in a third vote and called on British lawmakers to reconsider their stand in order to avert a no-deal Brexit by the April 12 extension date. In a statement to formally update Parliament on her European Council meeting last week where the EU agreed to a short delay to the March 29 Brexit deadline, the British premier said she remained committed to "guarantee Brexit" even if it isn't as initially planned for this Friday and would continue to lobby MPs to get the support required for another vote on the withdrawal agreement agreed with the European Union (EU). "It is with great regret that I have had to conclude that as things stand, there is still not sufficient support in the House to bring back the deal for a third Meaningful Vote," May told the Commons. "I continue to have discussions with colleagues across the House to build support, so that we can bring the vote forward this week, and guarantee Brexit. If we cannot, the government made a commitment that we would work across the House to find a majority on a way forward," she said. The British PM confirmed that her Conservative Party MPs would be whipped to vote against an amendment tabled by fellow Tory MP Oliver Letwin, to wrest control of parliamentary proceedings away from the government to hold indicative votes on alternatives to Theres May's Brexit plan already rejected twice before by the Commons with huge margins over the controversial Irish backstop clause. "I must confess that I am sceptical about such a process of indicative votes...No government could give a blank cheque to commit to an outcome without knowing what it is," May said, promising to "engage constructively" over the indicative votes but without any commitment on backing any particular alternative. She warned that the UK would have to seek a longer delay to Brexit and be forced to participate in European Parliament elections on May 23 if the Commons did not approve her withdrawal agreement for a third time this week as a "compromise". She said: "I hope we can all agree, we are now at the moment of decision. And in doing so we must confront the reality of the hard choices before us. "Unless this House agrees to it, No Deal will not happen. No Brexit must not happen. And a slow Brexit which extends Article 50 beyond 22nd May, forces the British people to take part in European elections and gives up control of any of our borders, laws, money or trade is not a Brexit that will bring the British people together." May's Parliament statement came soon after she summoned her Cabinet for an emergency meeting, following a weekend dominated by rumours of plots and coups by both pro and anti Brexit wings of her Conservative party. It marked the beginning of yet another hectic week in Westminster, where MPs will try and gather support for one of many options, including a second referendum or even revoking Article 50 and reversing Brexit altogether. Opposition Labour Party leader Jeremy Corbyn attacked the government, branding May's approach over Brexit as a "national embarrassment". "It is time for Parliament to take control," he said, confirming that the Labour Party would be backing the Letwin amendment which takes power to control business in the House of Commons away from the government on Wednesday, to allow MPs to put forward business motions relating to Brexit. While the default position remains the UK crashing out of the EU without a deal unless an agreement is passed through Parliament, May told MPs that the government has laid the necessary statutory instrument changing the Brexit date in the Commons on Monday. However, effectively the Brexit date has already changed under international law with the EU legislation delaying the deadline last week. If British MPs fail to pass the statutory instrument, it would create some "legal uncertainty" but it would not change the internationally-recognised Brexit date, which is now set as April 12 -- with an offer of a further extension until May 22 if the withdrawal agreement clears the Commons hurdle in a third vote this week. Meanwhile the European Commission released a comprehensive document detailing its no-deal "preparedness", stating that it is "increasingly likely" that the UK could leave the 28-member bloc without a deal on April 12. "In such a scenario, the UK's relations with the EU would be governed by general international public law, including rules of the World Trade Organisation," an EU statement said.